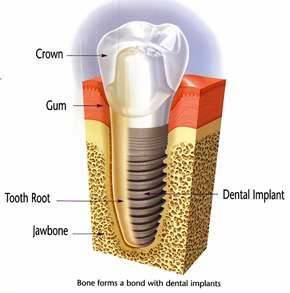 A dental implant is an artificial tooth root that supports a crown. It is made of titanium and surgically placed into your jawbone to replace the missing tooth root. Once the custom-made crown is placed on the implant, it will function just like a natural tooth. You will be able to eat with the same efficiency you had before. And no special oral hygiene procedures will be needed—you simply brush and floss as you always have. Implants are placed in a two-step process. First the root form is surgically implanted in your jawbone just below your gumline. Then bone grows in tightly around the implant, a process called osseointegration, anchoring it to the jawbone. The second step is placing a crown on the implant, which completes the tooth restoration. Dental Implants will work whether you are missing one tooth or multiple teeth. However, if you’re only missing one tooth, there are two good options for replacing the tooth: an implant or a dental bridge. A dental bridge actually requires the use of three teeth: the tooth that is actually being replaced along with the two adjacent teeth. The two adjacent teeth will be prepared for crowns. Attached between those two crowns will be the prosthetic tooth. 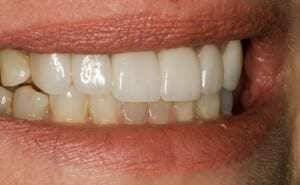 If the two adjacent teeth need crowns anyway, a dental bridge may be a much more sensible option for replacing your missing teeth. However, if those teeth are perfectly healthy, an implant may make more sense. SueAnn had a single implant done as well as a combination of crowns and veneers to restore her smile. 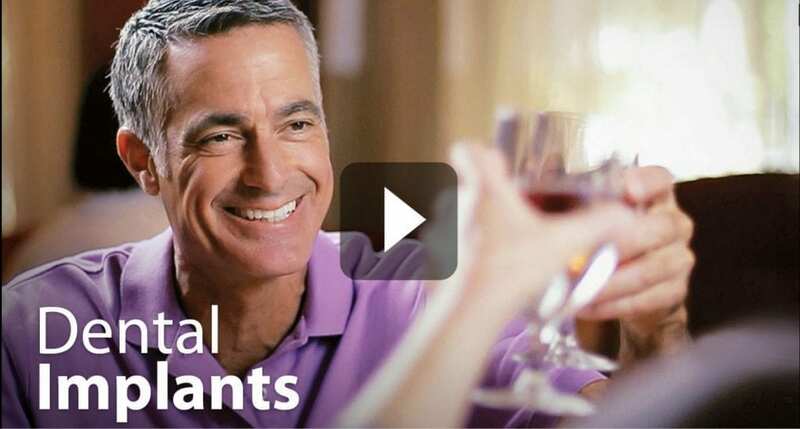 When you are missing all your teeth, there are significant advantages to dental implants. Removable dentures are uncomfortable. Because they rest on movable tissue, they will always tend to move around some. Because of this, you can’t chew nearly as well with dentures as with solidly anchored teeth. 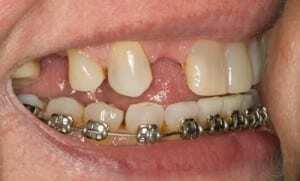 That also means there is a possibility of developing denture sores, or that they may slip out at embarrassing times. None of these problems occur with dental implants. The strongest advantage, however, is the prevention of facial collapse. Once you lose all your teeth, your jawbone begins to dissolve because your body reabsorbs all the minerals that your jawbone no longer needs. Gradually your dentures will no longer fit. After the bone is completely absorbed you may not be able to wear dentures at all. This is a serious condition known as facial collapse. The use of dental implants prevents facial collapse because your body interprets the implant as a tooth root and leaves the bone intact. Click here to read more about facial collapse. If you would like to know if you are a candidate for dental implants but aren’t ready to schedule an examination, we’d be happy to have you come in for a complimentary consultation with one of our doctors. Just give us a call, or click here to visit our request an appointment page.